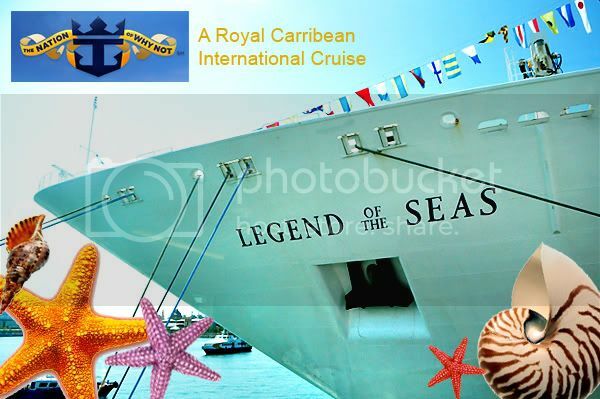 Legend Of The Seas - LOTS to Do! What stories does the Legend of the Seas (LOTS) behold? 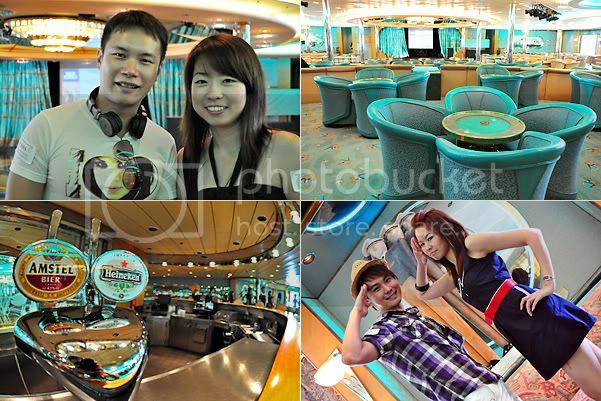 Join me on a nautical exploration onboard this 70-tonne cruise ship! The last time I took a cruise holiday was when wavy perms and baggy pants were in vogue; and Enya's Orinoco Flow urged all to "sail away, sail away", bringing about a revival of the Celtic voice in New Age anthems. Point is, that's a long time ago. My cruise memory dates so far back, it has become somewhat of a personal legend where I have a consciousness about it, but I cannot prove it happened because there are no details for recall or photos of my encounter. When I first saw the cruiser, I was wow-ed by the size of it. But it is still considered a baby compared to the biggest ship in the Royal Caribbean fleet - the soon-to-be launched Oasis of the Seas which weighs in at 220 tonnes. If LOTS is already so massive, I can't imagine the size of its new sibling. 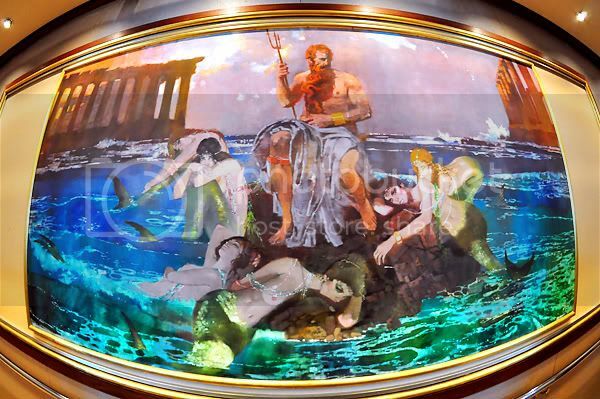 The Romans call him Neptune, the Greeks revere him as Poseidon. 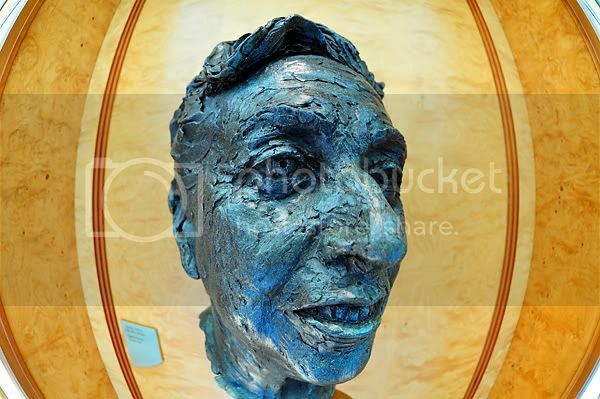 No magical seafaring legend would be complete without the likeness of him. 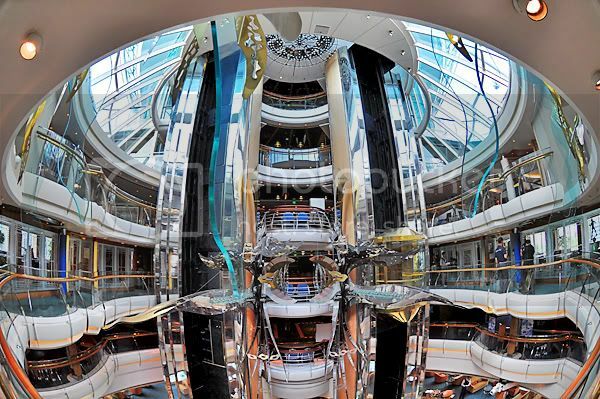 Owned by the multiple award-winning cruise operator, Royal Caribbean International, LOTS sailed its maiden voyage in 1995 and has gone through refurbishment recently. LOTS of class in terms of decor and furnishings. 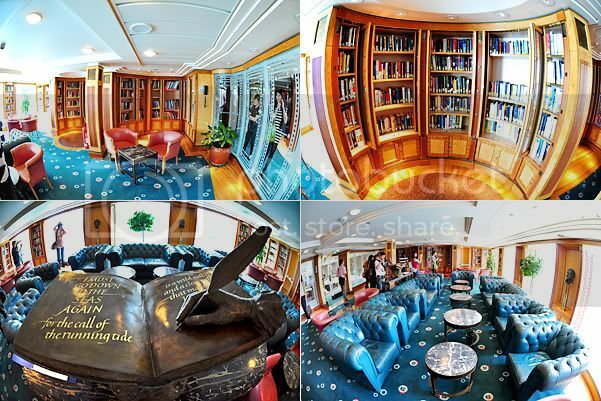 The ship's interior is an interesting blend of grand European fashion, Renaissance art, and contemporary fixtures. If you 'smell' something fishy about my camera angles, that's because I'm using my new fisheye lens which I bought to coincide with this half-day excursion. Been wanting to get a fisheye lens for the longest time and this is the perfect excuse to get it despite the chagrin of my dieting pockets. I hope it'll turn out to be a worhtwhile investment. This is the central axis that runs through various deck levels of the ship. 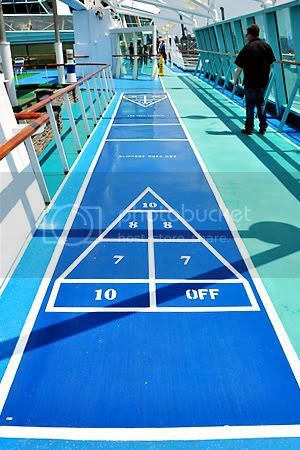 According to the ship's cross-section plan, there're a total of 11 decks that house a myriad of activity areas for children, youths, adults and the whole family. 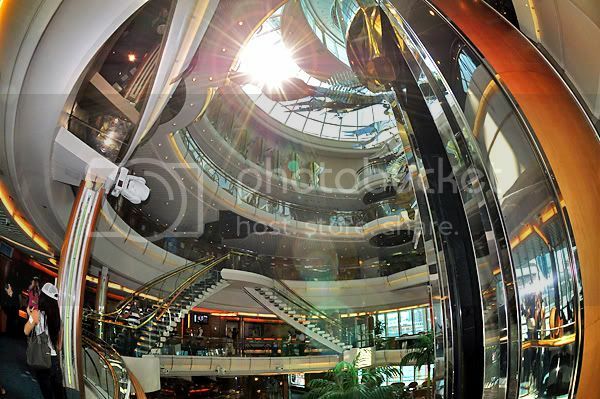 Facilities include various lounges, dining rooms, a casino, library, day spa and fitness centre, solarium, theatre, shopping arcade, and sporting nodes on the sun deck. More about the ship's highlights here. This is the first time I'm meeting so many bloggers on a face-to-face basis. There were more than 50 of us! I really enjoyed the fellowship and opportunity to learn from many of them in that short time. They were so friendly and helpful, it felt as if this wasn't the first time we met. The Anchors Aweigh Lounge is where one can relax to live jazz music or hold a private function in a spacious, yet cozy setting. Before the tour started, all of us gathered for a briefing at the Anchors Aweigh Lounge. Even though the lounge wasn't operating, I can imagine sitting in the cushy emerald couches, sipping a cocktail and just relaxing to the sounds of smooth jazz. One of the things that surprises onboard was a mini shopping 'district'. It's a district because there weren't just one or two shops but a collection of shops selling all kinds of stuff from clothes to skincare products to souvenirs to my favourite... booze! 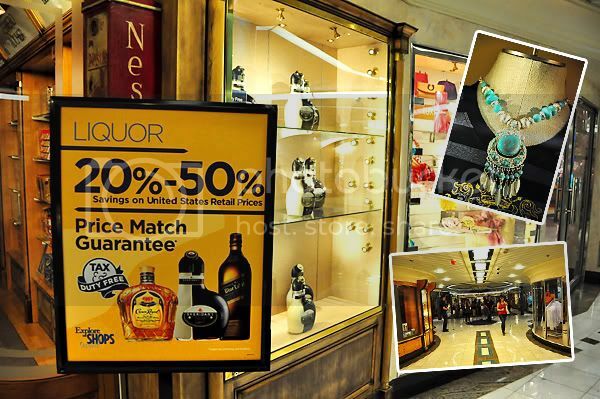 Shopaholics can go wild at the shopping arcade where there's a price match guarantee. If you can find the same item on land at a cheaper price, they'll match it. Prices onboard the ship are in US dollars and there's even an ATM machine for cash withdrawals. However, a cashless system is in place where expenditures onboard are charged to a tap card (called SeaPass) issued to every passenger. The expenses are consolidated and charged to the credit card or settled in cash upon disembarkation. For the bookworms, there's a well-stocked library offering various genres ranging from popular novels to biographies, children's books, periodicals, and self-help titles. Looking at the bas reliefs of literary intellects surrounding the library, I already feel so smart without even touching a book! There are no fools in knowledge or no knowledge in fools? Can you imagine sitting on the large leather sofa with an interesting read, your favourite music plugged into the ears, drinking wine and see a different scenery each time you look up from the book and let your imagination be projected onto the seawater? Having watched enough of seafaring disaster movies, I'm convinced that living quarters aboard all ships are the same. They are crammed, claustrophobic pigeon holes. That has always been my impression, so since I have a dislike for confined spaces the size of all the seven seas added together, going for a cruise vacation was never enticing. But having seen the different rooms that hoi pollois like me can afford, their roominess ain't too bad. They weren't the sardine jackets in my head. The room comes with attached bathroom, sofa seating area and a small television. The cabin rooms were not as small as I imagined them to be and looks very comfortable. Pretty girl not included. There are also oceanview rooms where you can wake up to dancing waves outside your window and rooms with a balcony to sit and just let your thoughts unwind over the vast expanse of sea and sky. 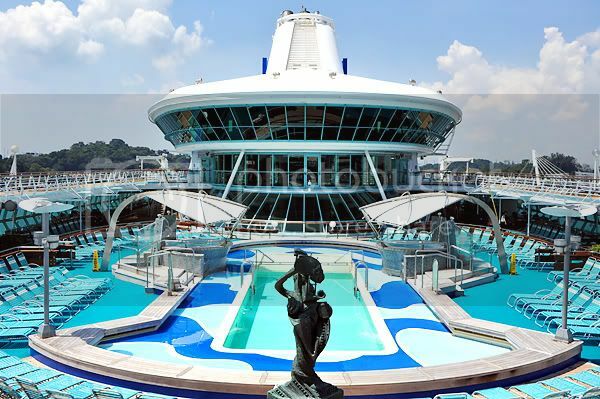 The prices for the various room types are listed on Royal Caribbean's website, but as a rough guage, it costs about S$500+ per person for a 3 nights' cruise around Malaysia. 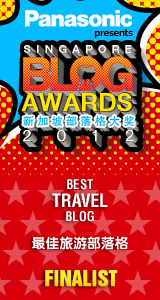 You can also choose different routes that can last between three to nine days around Asia. The cruise will make stops at key ports around the region and you can take land tours to explore the area. 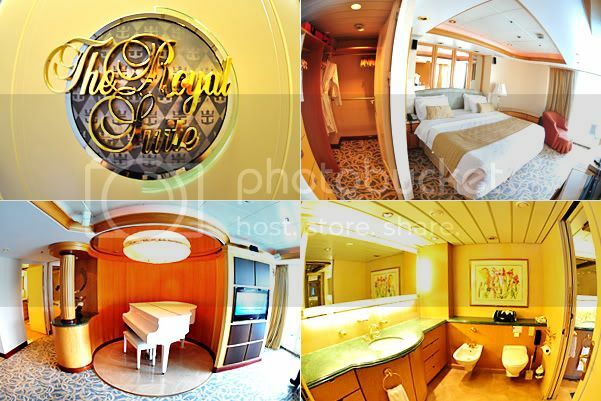 With ultra posh decor and interior furnishings, the Royal Suite would tease even Neptune out of the waters. 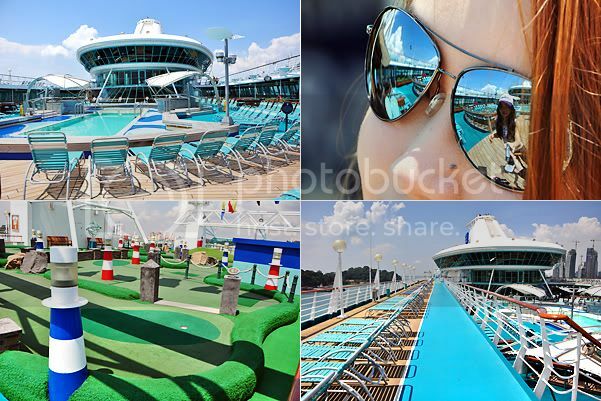 The swimming pool could be considered the crown jewel of every cruise liner and the one on LOTS sits like a gleaming aquamarine under the glorious sun. 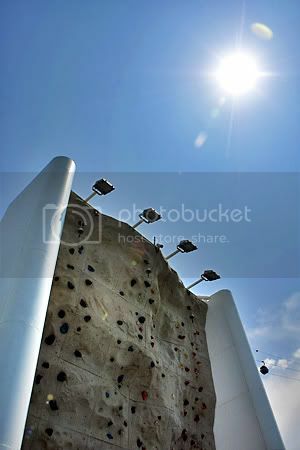 Apart from the pool and outdoor jacuzzis, the sun deck also comes fitted with a jogging track, mini golf course, floor games and get this, a rock climbing wall! It must feel awesome to be on top of the wall and looking out to the ocean at such a high point. I can sooooo see myself baking on the open deck for hours and lazing the hours away, never mind that the UV rays causes skin damage and premature aging. No point having youthful looks but no youthful activities! 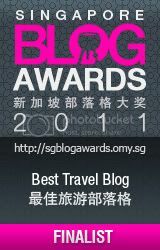 This visit to LOTS is an event organised by Omy.sg and amongst the bloggers who did the half day tour and blog about it, 10 will be chosen to go on a 5 days 4 nights Isle of Southeast Asia Cruise. If you see more posts about the cruise in upcoming weeks, you know I'd made it. 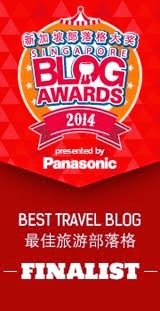 Else, I hope this post gave you a good idea of what's it like to enjoy a holiday aboard LOTS. But of course, the facilities, the rooms and the sun deck are just mere enablers to experiencing the greatest part about LOTS. It's the service. It is excellent beyond words and the place to truly taste it is at the Romeo & Juliet Dining Room. 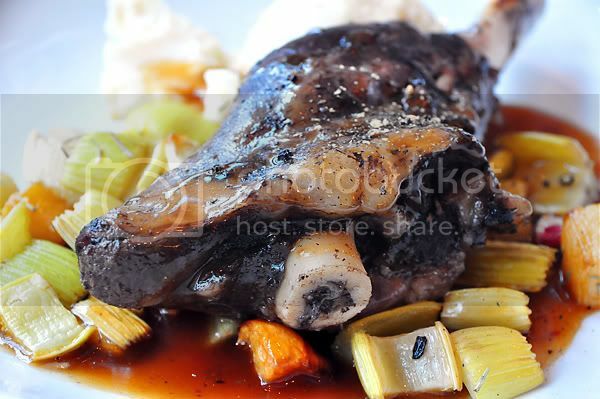 Mutton's tastier than this lamb shank I had. The meat slides right off and retains the nice mutton flavour that is simply baa-arvellous. Don't get me wrong, the staff at all the other sections be it our tour guide James or the many housekeepers I came across were all courteous and very ready to greet with a smile, but it was at the dining room that I had the immense pleasure of experiencing the full extent of it. I think the service was more delicious than the food although I did enjoy every bite of my lamb shank. The eating experience was well seasoned with a service standard that's 5-star to say the least. 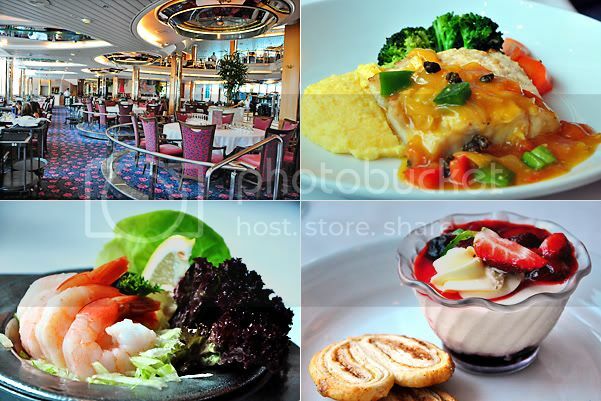 Other than the Romeo & Juliet Dining Room, there are a couple more eating outlets and a buffet-style restaurant. The buffet spread had as many choices as there are creatures in the sea. 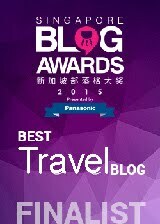 I hope this blog has given you a useful glimpse into the Legend of the Seas should you consider a cruise vacation. I would like to thank the organisers for this opportunity to add a new experience to my memory, and this time, I have photos and a record of it. For more photos of the outing, please click here. 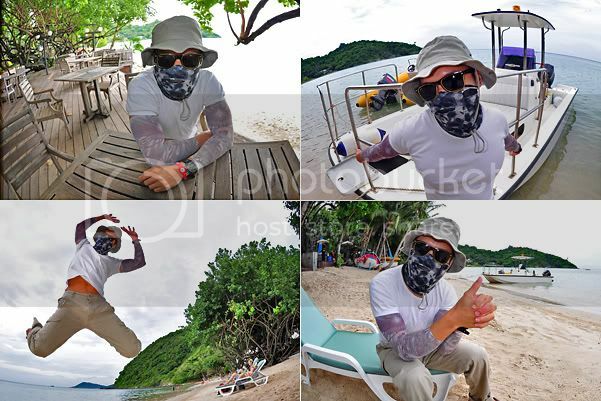 Took part in Tourism Authority of Thailand's Ultimate Thailand Explorers contest in Oct 2009 with my colleague, Jimmy, and won the Judge's Favourite team under the Koh Samui category (you can watch our contest video here). 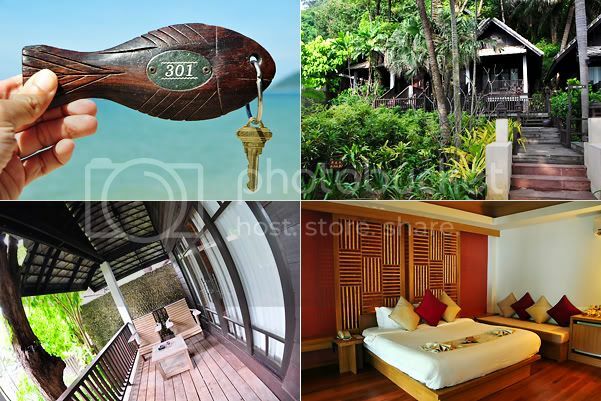 The prize is a 3 nights' stay at Ao Prao Resort, Ko Samed, valued at US$1,000. So here we are! 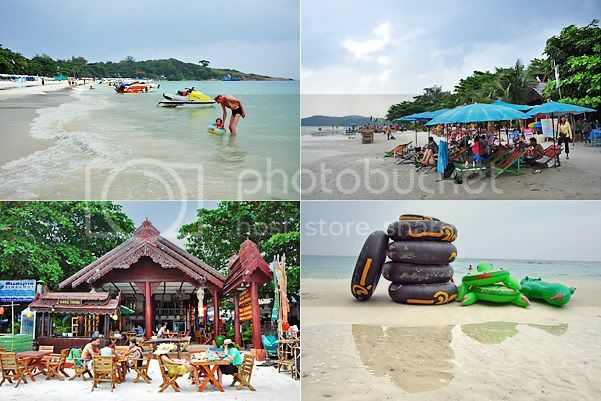 Many have heard of Koh Samui, but few know about Ko Samed so I shall share in detail about this island that sits at the crossroad of having both rustic charm and the extravagance of total relaxation. Since we booked the stay months ago, I was looking forward to sun-soak myself in Samed's immaculate waters but an unexpected touch of good fortune thwarted my plans to go lobster red during this trip. I was selected as a finalist for the Urban Homme Icon Challenge. 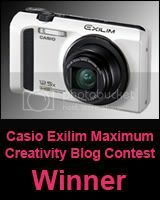 If you've been following my Urban Homme entries, you would know the hi-tech treatments I'm going through and why I must stay out of the sun's damaging rays at all cost during the contest period. No basking in the sun at a beach resort... it's like having a corked bottle of wine but no opener. My terrorist (a.k.a. parking ticket auntie) look. Don't laugh at me or I'll bomb you. Or issue you a fine for illegal humour! Guests and staff at Ko Samed all gave me a weird look that said, "Poor guy, so young and already loony." But I managed to resist the temptation to not go into the sun, which caused me all my current skin pugmentations from over-exposure in my younger days, and managed to take it real slow on this idyllic island where the best amusement there is, are the thoughts in one's head. 1) Book a pick-up transport with the resort you've made a reservation to stay at. Cost starts from 500 bht and there's a stipulated minimum number of people to travel. If your group size is less than that, you'll have to pay the difference. Eg. 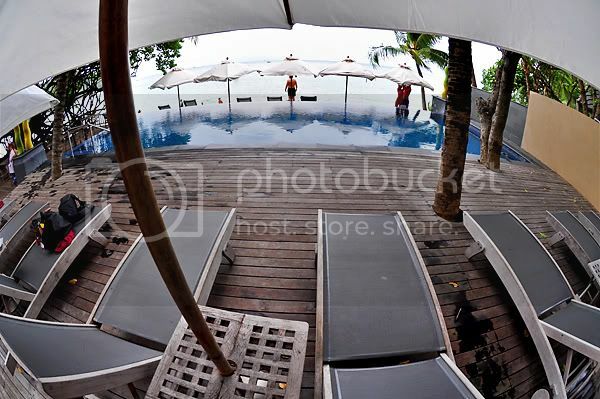 Minimum of 4 people to travel for the price of 500bht per pax (2,000bht). If only 2 of you, then you'll have to pay the price for 4 (2,000bht). Journey takes about 3 hours. 2) Take public transport which costs about 200bht per person. Journey takes about 4 to 5 hours. For 15bht one-way, you can now take the Bangkok Rail Link to the city. It takes about 30 minutes to go from Suvarnabhumi Airport to the connecting Phaya Thai BTS Station. 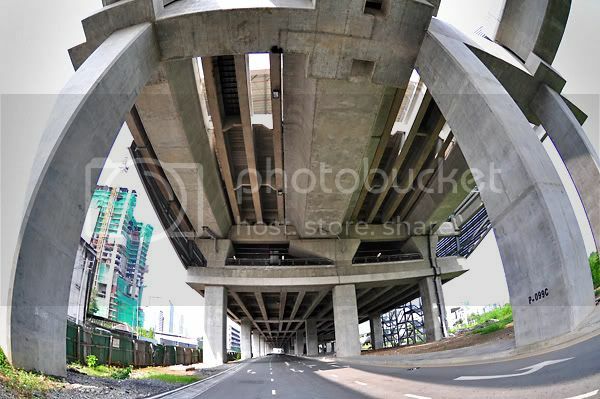 - Take Airport Rail Link (at B1 of Suvarnabhumi Airport) to Makkasan Station (15bht). Exit station and go to Phetchaburi Station. 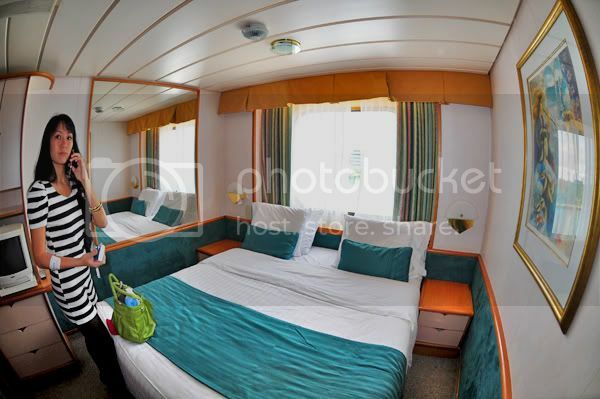 - Take MRT from Phetchaburi to Asok Station (20bht). Exit station and go to Sukhumvit Station (they're linked). 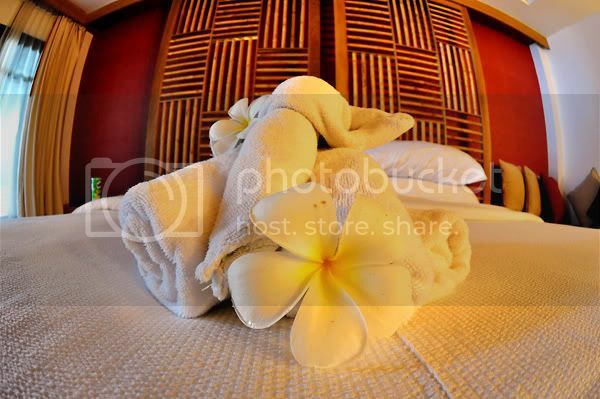 - Take BTS from Sukhumvit to Ekkamai Station (25bht). Exit station and walk to Eastern Bus Terminal. 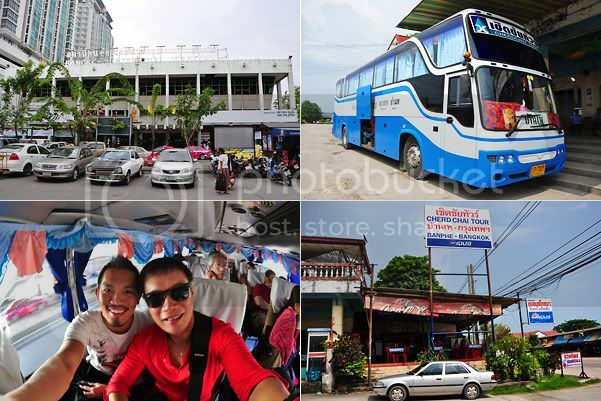 - Take bus from Eastern Bus Terminal to Ban Phe / Rayong. If you buy a one-way ticket, it's 157bht. If you buy return, the coming back ticket costs 117bht (40bht discount), so total cost is 274bht. The bus is air-conditioned with basic comforts and come with an attached toilet. That's important because there're no rest stops throughout the journey. Thankfully I have my new LG Optimus One phone to keep me entertained. The spelling for Ko Samed can be confusing. 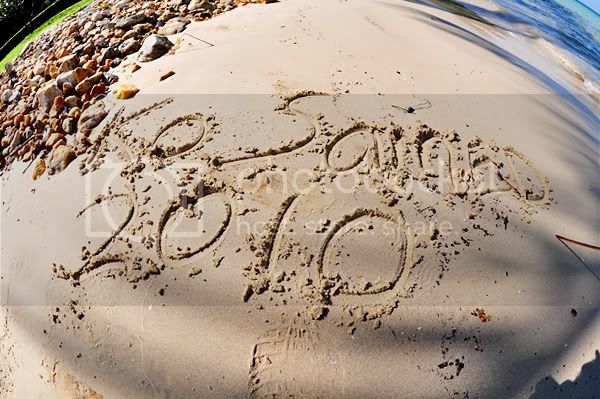 Sometimes it is spelt with a 'd', sometimes with a 't' as in Ko Samet. But they mean the same place. 'Ban Phe' is also sometimes spelt Baan Phe, while Ao Prao can have the following permutations - Ao Phrao and Ao Phoa. A case of being different but same, same. However, it caused me some concerns because in Thailand, a letter difference may land me in a totally different place (eg. Chiang Mai and Chiang Rai. 'M' and 'R' dictates totally different destinations). After much research and comparison of websites, I decided that the common spelling are 'Ko Samed', 'Ban Phe', and 'Ao Prao'. The difference in spelling was not the end to my confusion. 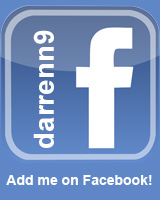 When I posted on Facebook to ask for help in getting to Ban Phe Pier, I got directions on how to get to Rayong. Fact is, Ban Phe is located in Rayong, so are a few other piers, and it's sort of the gateway to get to Ko Samed. You know you've reached Rayong when the bus journey's scenery changes from pastures of willowy gigantic lalangs to an overcrowding of shops selling beautiful shell curtains and crafts. Rayong is a very small seaside fishing town with the very pronounced and distinctive smell of sea harvests such as fish, shrimp and squid drying in the sun. Which means that if you're going to purchase dried seafood here, they're guaranteed to be 'fresh'. The small dusty town of Rayong produces lots of dried seafood and decorative knick-knacks made from seashells. 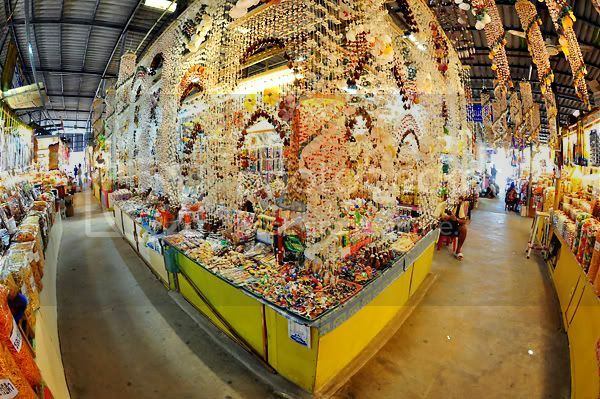 For as low as 15bht, you can bring home a hanging pendulum of shells. 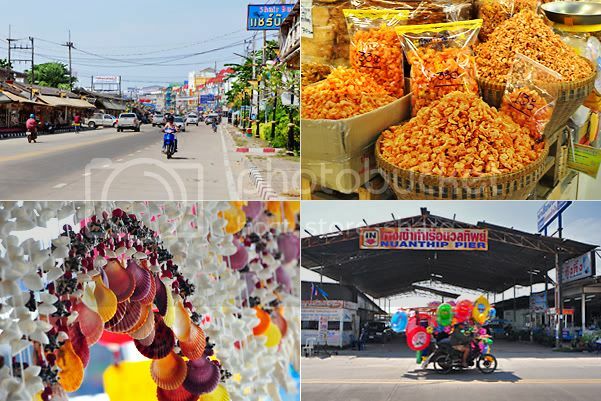 I think it is possible to explore Rayong on foot although there weren't any attractions except for this huge market opposite the bus station that sells local produce. If you like dried cuttlefish tidbits, buying here would be cheaper than in Bangkok. For the same grammage, a pack of the snack costs 100bht at Rayong and 150bht at Mahboonkhrong in Bangkok. I'm still kicking myself for not buying at Rayong. Boats depart daily for Ko Samed from the various piers according to a fixed schedule (hourly during morning and evening peak hours, and at about two hour intervals during off-peak periods). 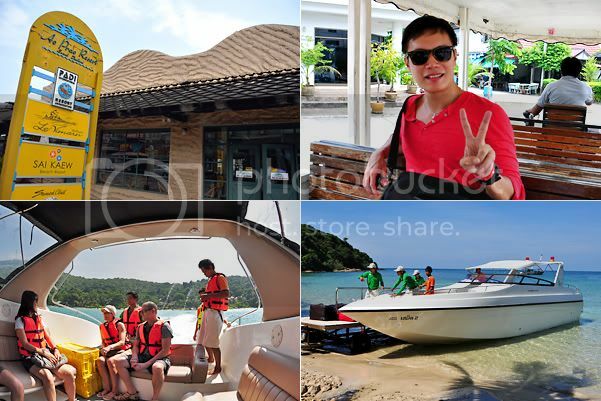 Our boat transfer at Ban Phe Pier was included in the prize package so we had to locate the Ao Prao representative office which belongs to the Samed Resorts group. It took us about 10 minutes to walk from the bus station to the office and along the way, motorcycle 'taxis' offered to take us there for 20bht. I didn't mind taking up the transport offer but I couldn't imagine how am I going to balance my lugguages on the bike. Plus, there're two of us. We sure don't want to be the town's circus act. I don't know the price of the boat ride but I think there're two options - bumboat and speedboat. We were given the speedboat land-to-island transfer which took less than 15 minutes. I presume it takes longer with bumboat and ferrying duration may also vary according to which pier you're landing at on Samed. Although fast, the speedboat ride was rather bumpy, but I liked it because it jostled my bones after a long bus ride and added excitement! 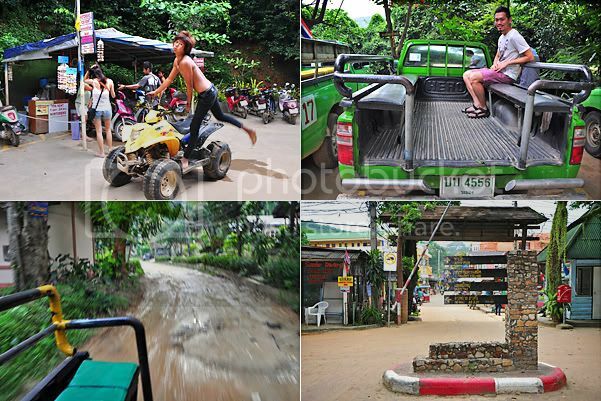 Ko Samed is not a very big island shaped like a gun and there're a few ways you can get around the island - hire a 'taxi', rent a motorcycle, or rent a four-wheel dirt bike. My advice is take the 'taxi' which is a small pick-up lorry rather than a car. They don't run on meter and it's a fixed rate according to distance. Getting from Ao Prao to Sai Kaew, another beach resort across the broadest section of the island, cost us 200bht one-way. The ride was about 20 minutes not so much because Sai Kaew is far, but because the road is unpaved and very bumpy. Especially when it rains, water is trapped in the many potholes of the muddy road and you'll have to be prepared to get dirty riding the motorcycle or dirt bike. As the roads are unpaved, it is also not advisable for anyone without experience in riding a motorcycle to try because the road conditions are accident-traps. The four-wheelers are a better and more stable option. It looked fun too and I almost wanted to rent one and ride around the island on the last day there but decided against it since Jimmy left a day earlier and I was all alone. Best not to venture when no one knows your whereabouts in case something happens. 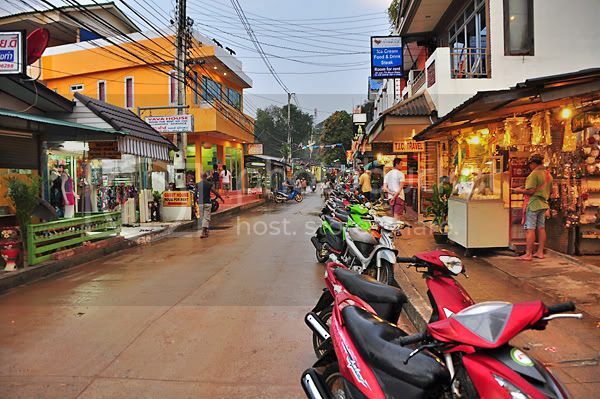 This busy road lined with shops, restaurants and bars is the 'Orchard Road' of Ko Samed. It has a rustic kampong appeal spoilt only by the polished establishment of 7-Eleven shops... an absolute necessity for recognising something familiar in a foreign land. I was told that tourists can rent motorcycles or dirt bikes at Sai Kaew and leave it at the resort for the rental operator to pick up when they leave. I don't know how much the rental is but it costs about 300bht to rent a motorcycle and 500bht for a dirt bike for a day with the transport operator found at the entrance to Ao Prao Beach (there're several beaches around the coast of Ko Samed and Ao Prao is just one of them). Sai Kaew Beach seem to cater more to the local Thai population with a wide offering of sea sports activities. Sai Kaew has its own beach. I didn't explore much of it because it was raining and it was starting to get dark when the downpour stopped. We had a very late lunch at a beachfront restaurant there and the food's not too bad. For about 1,000bht, we had Tom Yum Gai, stir-fried vegetable, pork omelette, big-head prawns with rice vermicelli, a glass of white wine, a coconut and a banana split. Tucked in a private and secluded spot at the end of Ao Prao Beach, Ao Prao Resort is a quiet sanctuary filled with lush greenery and offers a great sunset view. It incorporates the natural surrounding into its landscape and design, giving it a back to nature feel with the comforts of the modern necessities an urban folk like me is used to. Lazing by the poolside of Ao Prao resort with chilled wine while waiting for sunset would make for an awesomely romantic holiday. How I wish I wasn't undergoing makeover treatments and I wasn't there with Jimmy! The service at the resort was fast and personable with the staff ever polite and helpful. I was pleasantly surprised on the day of my check-out when I just took my lugguage out of the chalet and a staff promptly came up the stairs to carry my bags. 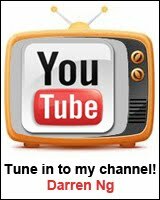 Talk about intuitive service! Ao Prao Resort is great for anyone looking to take a break from city life due to its location at the secluded end of Ao Prao Beach. The breakfast buffet was pretty good too. It had a good spread of local Thai offerings as well as Western breakfast favourites (ham, toast, cereals, open salads, etc). My favourite was the Thai-styled soups that changed daily and the thick, creamy and satisfying warm soya bean milk. Jimmy and I were very thrifty. We usually filled up on breakfast so that we can skip lunch because eating at the resort was financial homicide. An order of Pineapple Rice cost about S$16.00 and a Chicken Burger with fries and salad on the side cost S$13.00. But I must say, the Pineapple Rice was worth that price with the fresh succulent prawns and presentation in the hollowed out husk of a pineapple. Our seafront chalet was right next to the resort's lobby so it was very convenient. We could hear the live band music nightly and the beach was literally at our doorstep. We had wanted two single beds but we were told it's further up hill so we decided to stick with this king-size bed room which offered a fantastic view of the beach with a floor-to-ceiling picture window and was located right next to the resort's reception and restaurant. The room was spacious and delightfully furnished with natural wood, a look that instantly brings about an inner calm and relaxation of the mind. The only bummer was the lack of a bathtub to soak in, especially in the still of night, and just listening to the gentle waves washing ashore outside. Flowers were laid out daily on the bed and in the bathroom whenever the room was made-up. They really brightened up my day with their delicate beauty and a reminder that a flower doesn't bloom forever, so I must seize the day and enjoy the height of each blossoming moment. As mentioned earlier, there are several beach coast on Ko Samed. 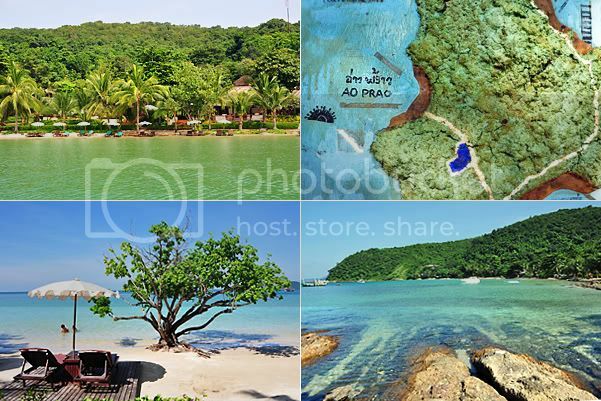 Ao Prao Beach is probably one of the shortest and most accessible stretch from mainland. The beach has fine white sand and extends for a few kilometres into the sea. 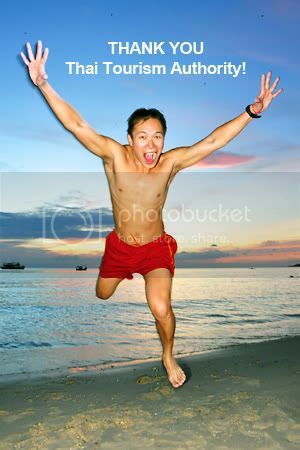 I could walk very far offshore with my my head still above the waters and the surf is very gentle and great for swimming. 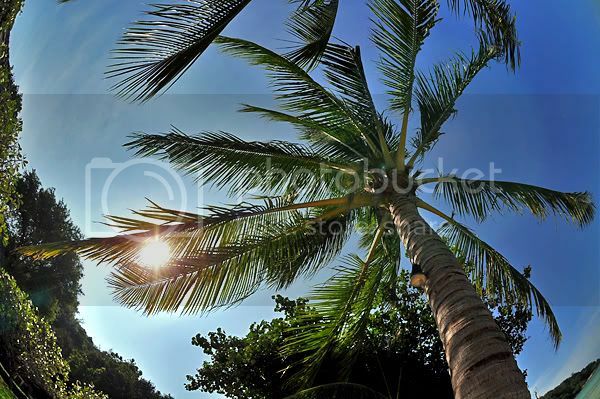 Sunlight filtering through tall, balmy coconut trees and the incessant sea breeze instilled an appreciation of life that's hard to come by living in the concrete jungle that is Singapore. In many ways, this trip felt less than fulfilling. Firstly, it was because I couldn't exposure myself to too much sun and secondly, given the kind of setting and atmosphere, Ao Prao Resort and beach would be great for romance or enjoy a private time with family and friends. Being there with a colleague didn't bring out the full potential of the place although Jimmy is forever a creative and interesting person to hang out with. But somehow, something is amiss. Ao Prao Beach faces the sunset so it's a surprise at every end of the day anticipating what the colours will be like before the night and its stars take over this piece of islandic paradise. I feel that with a place like Ao Prao, it's either you're here with someone you love or you're here with a group of friends. To be here with just one person you work with doesn't quite unleash the full magic of this place or get mad over it. But I am very thankful to the Tourism Authority of Thailand for this opportunity to explore Ko Samed and putting a destination on my next romantic escapade! 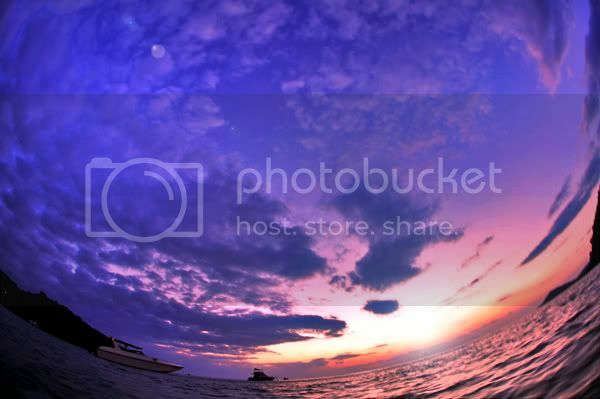 For more photos, please visit my album Ko Samed-ness.